Home » Vietnam Travel » Attractions in Vietnam » Why Does Quang Binh Have Many Unspeakably Beautiful Caves? Quang Binh (Quảng Bình) province, located in central Vietnam, has a lot of stunning caves, of which Son Doong (Sơn Đoòng) is the most famous – the world’s largest cave located in the UNESCO-recognized Phong Nha-Ke Bang (Phong Nha – Kẻ Bàng) National Park. This cave has drawn international attention of both experts and tourists worldwide. In essence, Quang Binh luckily possesses a system of diverse and attractive natural tourist values. 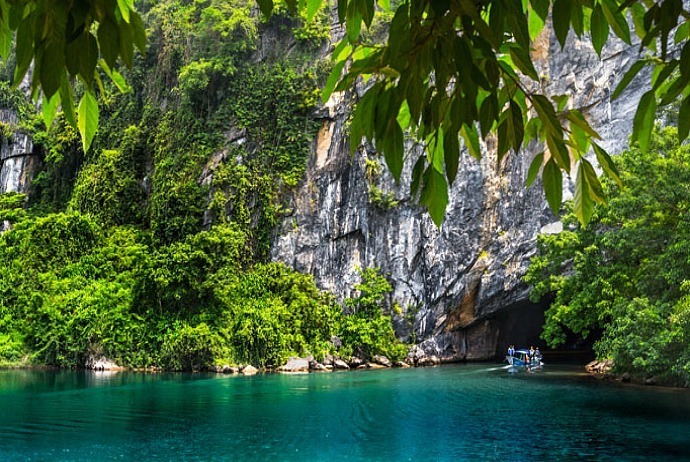 This province is captivating a large number of travelers, particularly who adore adventuring caves in Quang Binh. At the present, the most famous cave in Quang Binh is Son Doong Cave praised wildly around the world for its outstanding values and beauty. However, the expense to discover the cave is not totally suitable to ordinary tourists. So, why Quang Binh has many unspeakably beautiful caves like that? Let’s check out the explanation by Howard Limbert, the cave expert of the Royal of England. Howard Limbert is available in Quang Binh with the mission of introducing the potential caves of this province to the whole world. He explains the reasons why Quang Binh possesses a lot of unspeakably beautiful caves. According to this expert, the limestone blocks in this province are seamless with few faults, so caves often last from a few kilometers to tens of kilometers, creating large cave chambers, such as the world’s largest cave – Son Doong. Howard Limbert said: “Phong Nha-Ke Bang has a huge potential of caves. The massif in Ke Bang is giant and monolithic. Phong Nha – Ke Bang is a large area, we have just explored about 10% of this limestone desert, whilst the 90% left has not known, so there may be another cave bigger than Son Doong. We have only discovered 2 cave systems, the Vom (Vòm) cave system and Phong Nha cave system; the third system which we have not discovered yet is the Chay (Chày) River. Due to the amount of water in the nozzles near Eo Gio (Eo Gió) is abundant, chances are there will be a giant cave located over the mountain along the Ho Chi Minh (Hồ Chí Minh) road, west route, at the Mooc point. Mr. Limbert also emphasizes that, after a few decades of searching, the group of researchers has just generally concluded that thanks to the seamless, unbroken of the Ke Bang (Kẻ Bàng) massif, there are a lot of interlacing caves inside it, creating natural wonders. As expected, the expedition of Mr.Howard will carry out the latest cave searching in March, 2016. The scientists have found the mechanism of the formation of beautiful caves in the Ke Bang massif was derived from the sea. So, you have discovered the reason why Quang Binh has many breathtaking caves. Visit the gentle central strip of Vietnam, and pass by famous scenic and magnificent region – Quang Binh, travelers should not skip some caves here which are incredibly unique, and also the pride of people here. Having many cool cave systems, Quang Binh make countless tourists stupor and impressive. 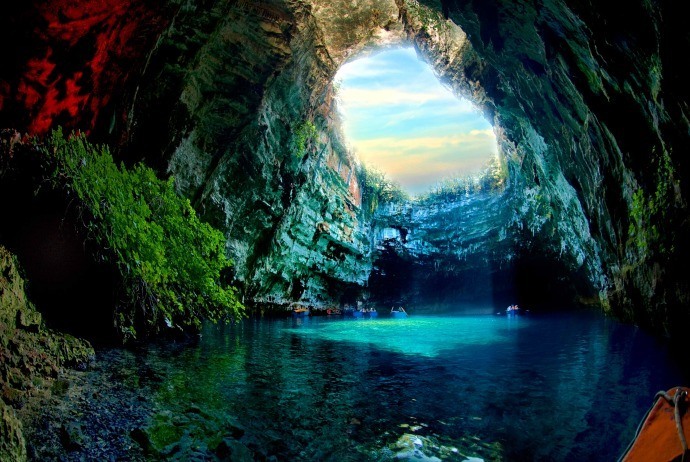 Take a look to see such caves! Tourism is always mentioned first upon talking about Quang Binh. Phong Nha Cave, once reckoned as Thien Nam De Nhat Dong (Thiên Nam Đệ Nhất Động) of Vietnam, was recognized as a World Heritage and was also been voted as one of the most beautiful caves of the world by the British Royal Associations. Phong Nha Cave is situated in the Ke Bang limestone mountain region, Son Trach (Sơn Trạch) commune, Bo Trach (Bố Trạch) district, Quang Binh province, Vietnam. It is covered by tropical forest. It takes about 30 minutes to get to the front cave entrance after flowing on the Son River. Flanked by majestic mountains and lush trees, this cave has trapezoidal entrances, only over 10 meters in height, with a wide of about 25-30cm. The more you go deep inside the cave, you will feel the cool atmosphere that is different from the hot feeling of the land air outside the entrance. The weathering process at this cave took place 250 million years ago. Phong Nha cave has steep and narrow cliffs. Covering a total area of 10,000 km2 and extending more than 200km to northern of Truong Son mountain, Phong Nha Cave has an underground river, passes through the Trooc River, Son River, Chay (Chày) River, RaoThuong (Rảo Thương) River and comes from small streams. Here, the water crept to En Cave prior to flowing into the limestone, creating the caves which are as large as today. Up to now, Phong Nha Cave is the longest dry cave in Asia with the length of 31.4 km, the width of 30-100m and the height of 60-80m. After conquering the thick forest, travelers have to climb up 500 stone steps in order to reach Phong Nha Cave. Under the ground are giant stalactites and rocks in different shapes and starts that sparkle in the soft light of the bulbs around this cave. The ceiling of Phong Nha Cave is rather similar to a huge dome with a lot of stalactites falling like chandeliers. This cave becomes more extended when tourists go deep inside to reveal a vivid world in the ground. Stalactites in Phong Nha Cave are like the symbol for the history of millions of years. This cave is also unique for the white great stalactite columns. There is a 100m air-shaft in the cave, getting the sunshine directly to the cave’s bottom. Tourists will feel a bright halo or a cool breeze wind. There is a stream that flows underground with the white foam and 500m2 large rocks. In order to protect Phong Nha Cave, the travelers are directed to head to wooden paths and not permitted to touch the stalactites. Today, this cave just exploits 2 tourism products, including 6 kilometers of exploration for adventurous tourism program and visiting the cave for tourism only. This famous cave is newly discovered recently and made interesting waves spread all around the world. The animated Son Doong is currently the most popular tourist attraction in Quang Binh province. Belonged to Son Trach (Sơn Trạch) commune, Bo Trach (Bố Trạch) district, Son Doong is located in the cave of Phong Nha – Ke Bang and is currently winning the record of being the largest natural cave in the world. It has been ranked the eighth in the list of 52 places to travel to in 2014. Son Doong Cave, located in the heart of Phong Nha – Ke Bang National Park, has been explored in 2009-2010 by the British Cave Research Association (BCRA). This cave has just been open to tourism and public since 2013. Up to now, just a few lucky people have the unbelievable experience of exploring the largest cave of the world. When it comes to the way that Son Doong Cave has been first discovered, the story is interesting. A local man named Ho Khanh (Hồ Khanh) used to spend many weeks on end trekking and maneuvering his own way though Phong Nha – Ke Bang National Park to search for timber and food in order to earn his modest income. Then, in 1990, whilst being out on hunting, he stumbled across the opening of a limestone cliff, and then moved forwards in order to investigate. When he approached, he realized the clouds swelling out of the entrance, and heard the river sounds raging inside the cave. After feeling a strong wind blowing out from this cave, he moved on without any further inspection. He then came back home and forgot the exact location without thinking more of it. Concurrently, the two members of BCRA, Deb and Howard Limbert, were engaging themselves in Phong Nha to carry out exploratory cave expeditions in the region. Whilst having a conversation with Ho Khanh one day, he talked about the cave with clouds with a river inside that he had found in the past. Deb and Howard were stimulated and urged Ho Khanh to rediscover this cave. After a lot of failed efforts, they started to think this cavern may never be discovered. Later, in 2008, whilst being out on a food gathering trip, Ho Khanh found the mysterious opening again and carefully took note about how to get there. Then, in the next year 2009, he led Deb and Howard along with a professional team back to that cave for expedition the place which later became known as Son Doong Cave, also known as “Mountain River Cave”. 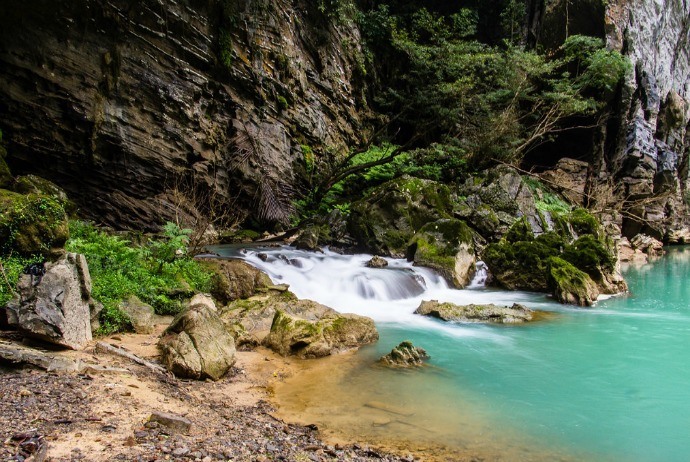 Talk about the geology of the largest Son Doong Cave, formed on the fault zone’s edge, Son Doong Cave has been carved out by Rao Thuong (Rảo Thương) River when it erodes the limestone, crating the vast tunnel beneath the Annamite Mountains. The giant sinkholes, aka dolines, collapsed about 300,000 years ago, thereby creating the massive openings to the world outside. The pearls of the cave with the size similar to baseballs were formed by the water dropping from the cave ceiling. Son Doong Cave was confirmed as the largest cave in the world because it is 5 km in length, with parts reaching up to 150m in width and 200m in height. The cave is large enough to contain a whole New York City Block, responsively with a skyscraper of 40 stories. With the total measured quantity of 38.5 million cubic metres, Son Doong Cave surpasses the Deer Cave in Malaysia that was reckoned to be the former record holder. In order to arriving Song Doong Cave, adventurers have to pass through the village of Ban Doong (Bản Đoòng) ethnic minority. This is the only village situated inside Phong Nha – Ke Bang National Park and has less than 40 residents. For people living here, life is tough because of their isolation from the world outside. The only access method is by foot, and the dense jungles that surround Ban Doong forbid the cultivation of crops. For many people, visiting Ban Doong and meeting its friendly villagers becomes a significant highlight of their journey. Ban Doong features a way of life which has not been changed for many centuries. In Vietnamese, Paradise cave is known as Thien Duong (Thiên Đường) Cave, which was dubbed the underground palace. This is one of the wonders of the most magical sparkling world. This cave has a poetic but mysterious beauty, so it becomes one of the most well-known tourist attractions of Quang Binh. Thien Duong Cave has irresistible magic, and so many people say that it is really the most beautiful wonder of the creator on earth. Situated in the middle of Phong Nha – Ke Bang National Park, approximately 4km west of Ho Chi Minh road, the cave which is thought to be formed hundreds of millions of years ago, is surrounded by rocky mountains and underground streams. Thien Duong Cave is about 60 km from the city of Dong Hoi. Experts said that this cave is more beautiful than Phong Nha, called the no.1 cave in Vietnam. Its stalagmites and stalactites have been built over thousands of years and beat the imagination of tourists. Whilst being on the wooden path, tourists can’t help but contemplate and admire this present of the Mother Nature. Located in Phong Nha – Ke Bang National Park, Tien Son cave was discovered by a local person by accident in 1935. The entrance of the cave is 1 km from Phong Nha Cave, at the altitude of about 200m. Tien Son cave lasts 980m. About 400m from the entrance of the cave, there is a 10-meter deep hole and followed by an underground cave that is 500m in length, so it is dangerous for normal tourists; this just open for professional expeditionists. 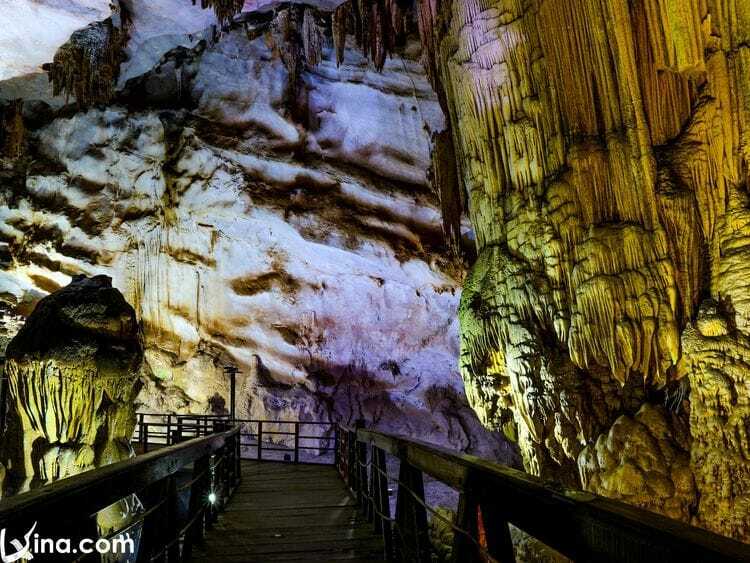 Similar to Phong Nha cave, Tien Son cave features enormous stalagmites and stalactites shaped liked fairy-tales. Stalagmite and stalactite columns and walls here create the sounds like the sound of drum and gong if being knocked with hands. 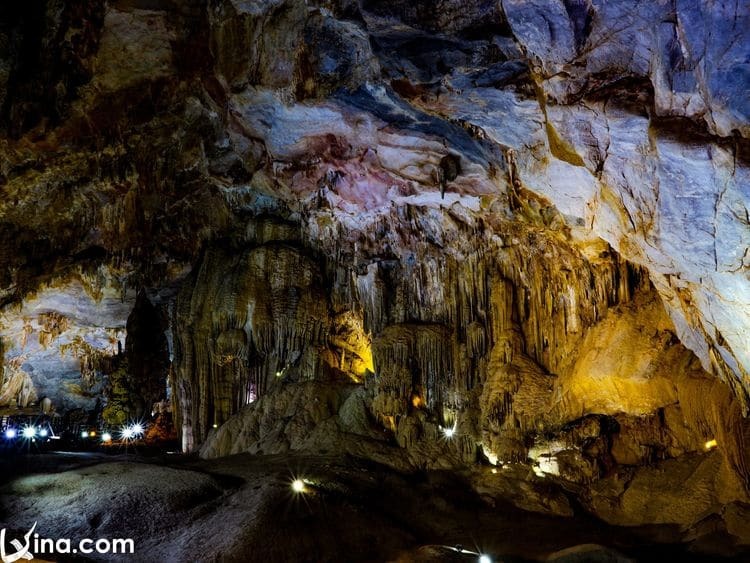 According to scientists, the cave was created tens of millions of years ago when the water current holed the limestone mountain in Ke Bang (Kẻ Bàng). Tien Son along with Phong Nha are part of the same cave system despite they seem not to be connected right now. In millions of years ago, Son River might flow through Tien Son yet now it flows down the valley. Tien Son cave is filled with spectacular stalactites, columns, and stalagmites. Maybe, its most surprising characteristic is its fallen stalagmites. Tourists could enter the cave through a winding path. It is impossible to visit Tien Son Cave without having to touch the formations. Tu Lan cave system seems lesser known than the above-mentioned caves, but it is always mentioned when people talk about the brightest pearl of Quang Binh tourism. Maybe, it is due to its elusive beauty which is like a “hard-to-get” pretty girl. The cave system is situated in the village of Tan Hoa (Tân Hóa), Minh Hoa (Minh Hoá) district, approximately 70km from Phong Nha northwest, containing 8 different caves. Tourists have to pass through the lush jungle, wading stream, and surpassing a lot of dangerous things in order to get to the cave. The most interesting point about this cave system is that tourists have to swim in the dark cave to contemplate the special beauty of 5 adjacent caves. Comprising Tu Lan Cave, Chuot (Chuột) cave, Ken Cave, Kim cave, and Song (Sông) cave, Tu Lan cave system spreads via 4 valleys which are covered with forests as well as unnamed rivers. 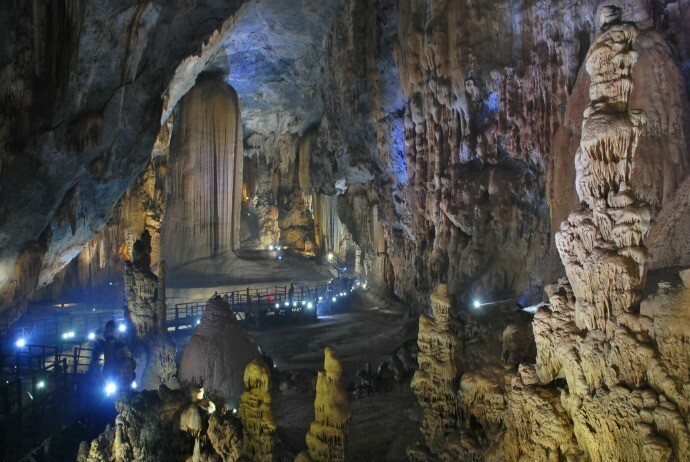 There are spectacular stalactites and stalagmites within the cave, along with underground rivers and small waterfalls, thereby making Tu Lan cave system a unique destination for both plain sightseeing and adventure. Due to the tectonic plates in the area are continually moving and bumping into one another, the mountains keep rising and moving forwards. The rivers cut into the mountain bottom, helping to carve new caves throughout the time. Therefore, the lower river caves are younger than the higher. The river caves like Tu Lan cave and Ken cave are young, just about 3 millions of years old. The stalagmites and stalactites are breathtaking and enormous. 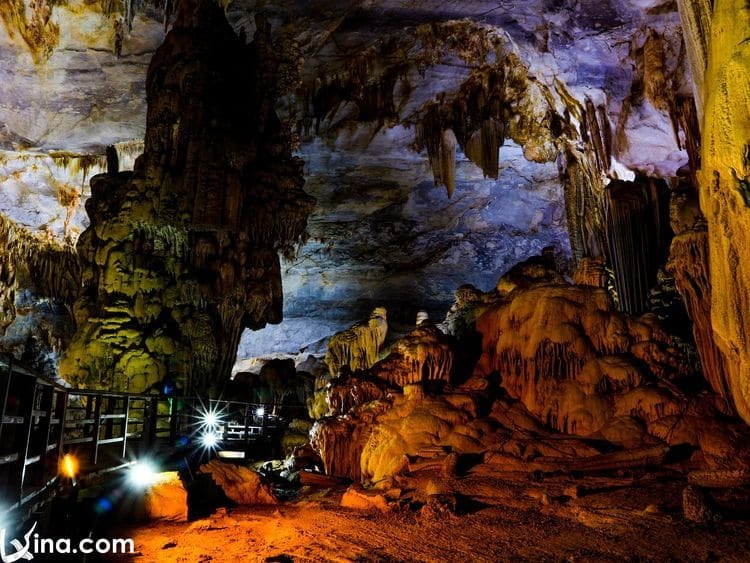 The Ken cave in Tu Lan cave system had been featured recently in National Geographic by the famous photographer Carsten Peter. Having many incredibly beautiful caves, Quang Binh has the priceless present of the Mother Nature and is ready waiting for you to explore.